Photomicrograph of a cresyl violet–stained midhippocampal section showing the regions investigated in this study. DG indicates dentate gyrus; CA1, cornu ammonis region 1; CA2/3, cornu ammonis region 2/3; and CA4, cornu ammonis region 4. Scale bar = 1 mm. A representative 2-dimensional difference gel electrophoresis gel, pH 4 to 7, indicating the protein spots found to be significantly altered in schizophrenia and/or bipolar disorder and subsequently identified with mass spectrometry. Protein identification numbers relate to the proteins listed in eTable 4 and eTable 5. MW indicates molecular weight. Validation of differentially expressed proteins. * P < .05; † P < .005. Protein expression changes were determined by fascin 1 dot blot (cornu ammonis [CA] region 2/3) (A) and PCMT1 enzyme-linked immunosorbent assay (CA4) (B) analysis in the 60 cases of the Stanley Medical Research Institute Array Collection. The means of 3 independent experiments are presented. Error bars indicate standard deviation. C-E, Western blots were prepared using lysates of subpools of hippocampus samples from patients with schizophrenia (lanes 1-4), control subjects (lanes 5-8), and patients with bipolar disorder (lanes 9-12). Immunoblots were incubated with antibodies that specifically recognize annexin 6 at 70 kDa (CA2/3) (C), septin 11 at 50 kDa (CA4) (D), spectrin at 100 kDa (CA2/3) (E), and ERK2, used as a loading control, at 42 kDa. The images show a typical blot and the corresponding graphs represent the signal intensity of the designated antibody measured by densitometry and corrected by the signal intensity of ERK2. The mean of 3 to 4 independent experiments is presented. Error bars indicate standard deviation. ERK2 showed no significant differences between disease and control (schizophrenia, P = .82; bipolar disorder, P = .65). In contrast to our 2-dimensional difference gel electrophoresis findings, significant changes were confirmed for fascin 1 in schizophrenia in CA2/3 but not in bipolar disorder. In keeping with our 2-dimensional difference gel electrophoresis experiments, PCMT1 and septin 11 expression were reduced in CA4 in both diseases. Annexin 6 and spectrin were found to be reduced in CA2/3 in bipolar disorder only. The Western blot results for both proteins confirmed significant reduction in bipolar disorder as well as schizophrenia. Context The hippocampus is strongly implicated in schizophrenia and, to a lesser degree, bipolar disorder. Proteomic investigations of the different regions of the hippocampus may help us to clarify the basis and the disease specificity of the changes. Objective To determine whether schizophrenia and bipolar disorder are associated with distinct patterns of differential protein expression in specific regions of the hippocampus. Design, Setting, and Patients A postmortem comparative proteomic study, including validation of differential expression, was performed. Midhippocampus samples from well-matched groups of 20 subjects with schizophrenia, 20 subjects with bipolar disorder, and 20 control cases from the Stanley Medical Research Institute Array Collection were analyzed. Main Outcome Measures We used laser-assisted microdissection to enrich for tissue from the hippocampal regions and 2-dimensional difference gel electrophoresis to compare protein profiles. Levels of differentially expressed proteins were confirmed by enzyme-linked immunosorbent assay and Western blotting. Hippocampi from haloperidol-treated mice were used to help discriminate drug-associated from disease-associated protein changes. Results Across all hippocampal regions, 108 protein spots in schizophrenia and 165 protein spots in bipolar disorder were differentially expressed compared with controls. Sixty-one proteins were differentially expressed in both disorders. One hundred fifty-two of these proteins were identified by mass spectrometry, and they implicated a range of different processes including cytoskeletal and metabolic functions. In both disorders, cornu ammonis regions 2 and 3 were affected to a significantly greater degree than other hippocampal regions. Additionally, numerous proteins showed expression changes in more than 1 region and more than 1 disorder. Validation work confirmed changes in septin 11 and in the expression of proteins involved in clathrin-mediated endocytosis in both schizophrenia and bipolar disorder. Conclusions Overall, similar protein changes were observed in schizophrenia and bipolar disorder and for the first time indicate that the most prominent proteomic changes occur within the hippocampus in cornu ammonis regions 2 and 3. The cytoskeletal protein septin 11 and the cellular trafficking process of clathrin-mediated endocytosis are implicated by our study. Unfortunately, our understanding of the molecular mechanisms underlying hippocampal alterations in schizophrenia and bipolar disorder is limited. While genomic investigations continue to contribute important insights28-31 and indeed point to a shared genetic basis,32,33 the core pathophysiology of these psychotic disorders remains elusive. A major limitation of genetic approaches is that analysis of nucleic acids alone cannot predict expression and function of the proteins they encode because proteins are undergoing a multitude of modifications from transcription to posttranslation.34 Equally, actual protein levels in cells do not reliably correlate with messenger RNA (mRNA) expression.35,36 Therefore, direct assessment of proteins, which represent the functional output of the cell, will be indispensable in the search for the molecular basis of psychotic disorders. Proteomics is the study of the proteome of a particular biological system in a particular state.37 Using proteomic methods, it is possible to assess global differential protein expression between disease and control states and to obtain novel insights into disease (for reviews, see the articles by English et al,38 Görg et al,39 and Tannu and Hemby40). Proteomic studies of postmortem brain tissue from subjects with schizophrenia and from subjects with bipolar disorder have focused largely on the dorsolateral prefrontal cortex41-49 and the anterior cingulate cortex.50-53 They have demonstrated alterations in cytoskeletal, synaptic, metabolic, and mitochondrial proteins.42,44-46,48,50,54 To our knowledge, with regard to the hippocampus, there has been 1 previous proteomic study in schizophrenia54 and none in bipolar disorder. Our investigation represents the first detailed proteomic study of the human hippocampus in schizophrenia and bipolar disorder. To account for anatomical and functional differences of hippocampal regions, we assessed 4 regions separately (CA1, CA2/3, CA4, and DG) using laser-assisted microdissection to achieve anatomical separation. The results of the study enhance our knowledge of the nature and extent of region-specific protein changes in psychotic disorders and may provide valuable information about the molecular mechanisms involved in these illnesses. Human postmortem brain tissue from the midhippocampus at the level of the lateral geniculate nucleus was dissected by Maree J. Webster, PhD, anatomist, Stanley Medical Research Institute. The series consists of 105 subjects, including 35 subjects with schizophrenia, 35 subjects with bipolar disorder, and 35 control cases. Information on prescribed psychotropic medication is provided by the Stanley Medical Research Institute. A subset of 20 samples from each of these 3 groups was selected to match as closely as possible for age and tissue pH.55,56Table 1 provides detailed demographic information on these 60 subjects. For a detailed breakdown of the main groups of prescribed psychotropic medications (eg, typical and atypical antipsychotics, mood stabilizers, antidepressants), see eTable 1. Investigators were blind to group identity until completion of the data analysis. Ethical approval was granted by the Royal College of Surgeons in Ireland Research Ethics Committee. Frozen tissue sections were cut by the Stanley Medical Research Institute and mounted onto membrane-covered slides (PALM Microlaser Technologies AG, Bernried, Germany). From each case, 1 section was stained very briefly with cresyl violet and a detailed image was obtained to mark the boundaries between the different regions (Figure 1). Consecutive sections (25 sections for each case) were then stained with methyl green as this had previously been shown not to interfere with protein integrity in laser-assisted microdissection.57 The laser microdissector (PALM Microlaser Technologies) was used in the cut mode as previously described.58 Areas of DG, CA4, CA2/3, and CA1 were marked on each methyl green–stained section of each slide using the PALM software, cut using laser-assisted microdissection, collected in microtubes, and stored at −80°C. Samples were processed and separated by 2-dimensional difference gel electrophoresis (2D-DIGE) as described previously42,44,46,59 (for detailed methods, see the eAppendix and eTable 2). After electrophoresis, scanning of the gels with CyDye-labeled proteins was performed on a Typhoon 9410 image scanner (Amersham Biosciences, Little Chalfont, England). Prescans were performed to adjust the photomultiplier tube voltage to obtain images with a maximum intensity of 60 000 to 80 000 units. Images were cropped using ImageQuant software (Amersham Biosciences), and protein quantification across experimental groups was carried out with Progenesis software (Nonlinear Dynamics, Newcastle upon Tyne, England). Ingenuity Pathways Analysis (Ingenuity Systems, Redwood City, California) was used to analyze the key biological relationships of all differentially expressed proteins (Table 2). Significant biological functions are categorized as of the signaling and metabolic pathways, molecular networks, and biological processes determined using Fisher exact test to compare the number of proteins that are most significantly perturbed in the data set. We selected 9 proteins for validation based on their potential scientific interest, the fold changes, the number of hippocampal regions affected, and the availability of antibodies. For 3 of the proteins chosen, namely BCL2 inhibitor protein, cathepsin D, and N(G),N(G)-dimethylarginine dimethylaminohydrolase, enzyme-linked immunosorbent assays or Western blots were not successfully optimized. However, validation work was successfully undertaken using enzyme-linked immunosorbent assay (protein-L-isoaspartate-O-methyltransferase [PCMT1]), Western blotting (spectrin, alpha, nonerythrocytic 1 [SPTAN1], armadillo repeat containing, X-linked 1 [ARMCX1], annexin A6 [ANXA6], and septin 11 [SEPT11]), and dot blot (fascin 1 [FSCN1]) in samples from the Stanley Medical Research Institute Array Collection (eAppendix) based on the suitability of the antibodies. Because the laser-captured material from hippocampal regions was very limited in quantity, for the proteins confirmed by Western blotting we were obliged to confirm differential protein expression on pooled samples such that every group was represented by 4 pools of 5 cases. Within each diagnostic group, subjects were randomly allocated to the 4 separate pools (eTable 3). To assess the effects of psychotropic medication on the expression of candidate proteins, hippocampal tissue was harvested from mice treated with 0.5 mg/kg of haloperidol for 28 days (eAppendix). Western blotting was undertaken on mouse hippocampal tissue homogenates for ANXA6, FSCN1, PCMT1, SEPT11, and SPTAN1 (eAppendix). Normalized spot volume data were extracted from the Progenesis software and log base 10 transformed prior to analysis to eliminate distributional skew and to give approximate normality. We chose, a priori, the covariates postmortem interval, refrigerator interval, and brain pH to be of interest as possible confounders of protein abundance, with the additional inclusion of drug use (antipsychotics, antidepressants, and mood stabilizers) as secondary analyses. Freezer time was not significantly different between groups and we did not include this variable as a potential confounder. Other covariates, which may also be considered as possible confounders, were highly correlated with our chosen set of covariates; for example, antipsychotic dose (included in secondary analysis), drug abuse, smoking history, and alcohol use were all highly correlated with each other (correlation >0.7). Consequently, we did not make further adjustment for these. Analysis of covariance (ANCOVA) was performed on the normalized spot volumes for each spot in each brain region, with age, postmortem interval, refrigerator interval, and brain pH included as covariates. Estimated differences between schizophrenia or bipolar disorder samples and controls were then obtained using linear contrasts and exponentiated to obtain fold changes. Significance testing was then performed at the 5% level using ANCOVA. Statistically significant protein spots, adjusted for the covariates, were identified by mass spectrometry. A false discovery rate60 of 5%, which incorporated data from the 4 brain regions in a single model (as a factor) while allowing different brain regions to differ in effect, was used to flag those spots statistically significant after adjustment for multiple comparisons. A χ2 test of association was used to determine whether the frequency of statistically significant spots was different between the 4 hippocampal regions. The ANCOVA results for each region were then combined to assess the number of regions in which a spot was statistically significant and to determine the degree of overlap of statistically significant spots in adjacent hippocampal regions. Two overall post hoc statistical approaches were undertaken to assess the effects of antipsychotropic medications, antidepressants, and mood stabilizers on the protein expression profiles. The patients with schizophrenia and bipolar disorder were combined into 1 group and the control subjects were excluded from this analysis. First, the effect of use of psychotropic medications at the time of death (on or off these medications) was analyzed using ANCOVA, adjusting for the covariates mentioned previously. Second, the cumulative effect of antipsychotic medications (fluphenazine equivalents in milligrams)61 on spot abundances was assessed. 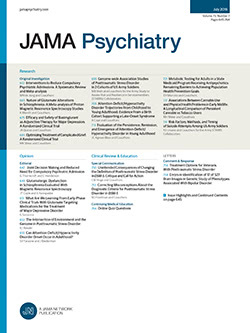 Lifetime antipsychotic dose was highly skewed; as a consequence, the combined group of subjects with schizophrenia and subjects with bipolar disorder was classified based on sample size into 1 of 6 categories as follows: (1) dose of 0 fluphenazine equivalents (n = 6); (2) dose of 5 to 3000 fluphenazine equivalents (n = 6); (3) dose of 4000 to 12 000 fluphenazine equivalents (n = 7); (4) dose of 15 000 to 25 000 fluphenazine equivalents (n = 7); (5) dose of 30 000 to 90 000 fluphenazine equivalents (n = 6); and (6) dose of 100 000 to 400 000 fluphenazine equivalents (n = 7).46 Note that the dose was unavailable for 1 patient, and this case was excluded from this analysis. The management of data and statistical analyses were carried out with SAS version 9.1 statistical software (SAS Institute, Inc, Cary, North Carolina) and R version 9.1 statistical software (R Foundation for Statistical Computing, Vienna, Austria). A total of 832 protein spots were identified on the master gel image, and these were matched across all gel images and statistically analyzed using ANCOVA (correcting for age, brain pH, postmortem interval, and refrigerator interval). Post hoc analysis investigating the effect of freezer time showed that including this variable in the analysis had no influence on our results. Across all hippocampal regions, 141 proteins (representing 108 individual protein spots) in schizophrenia and 203 proteins (representing 165 individual protein spots) in bipolar disorder were differentially expressed compared with controls. Sixty-one of these proteins were altered in both disorders. Note that 1 protein can be represented by more than 1 spot and several spots were differentially expressed in more than 1 region. Differential expression in the regions was observed as follows: DG, 23 spots in schizophrenia and 26 spots in bipolar disorder; CA4, 32 spots in schizophrenia and 30 spots in bipolar disorder; CA2/3, 53 spots in schizophrenia and 113 spots in bipolar disorder; and CA1, 33 spots in schizophrenia and 34 spots in bipolar disorder. Thirty-two proteins in schizophrenia and 38 proteins in bipolar disorder were altered across more than 1 hippocampal region. Accounting for proteins altered in both disorders and across several regions, 213 protein spots in total were differentially expressed. Of these, 152 protein spots were successfully identified by mass spectrometry. eTable 4 and eTable 5 list these findings, including details of their functional ontology and significance after adjusting for multiple comparisons (false discovery rate <5%). Identified protein spots are also indicated on a representative 2D-DIGE gel in Figure 2. We found a significant association between the hippocampal regions and the number of protein spots differentially expressed between schizophrenia and controls (χ2 test, P = .002). In bipolar disorder, this effect was even more prominent, with 113 spots differentially expressed in CA2/3 (χ2 test, P < .001). For schizophrenia, 141 spots were found to be differentially expressed in any brain region. This represented a set of 108 unique spots, of which 80 (74%) were unique to a single brain region and the remaining 28 (26%) were differentially expressed in at least 2 brain regions. For bipolar disorder, a total of 203 spots were differentially expressed in any brain region. This represented a set of 165 unique spots, of which 131 (79%) were differentially expressed in a single brain region and 34 (21%) were expressed in 2 or more brain regions. The first post hoc analysis found 37 of the identified proteins to be affected by psychotropic medication status at the time of death. The second post hoc analysis (the linear regression model) of the effects of lifetime antipsychotic dose found that only 16 spots were influenced by antipsychotic dose. For most spots implicated by the post hoc analyses, the direction of the fold change associated with psychotropic medications (n = 29 of 37) and lifetime antipsychotic dose (n = 9 of 16) was influenced in the direction opposite to that observed in disease groups (eTable 5, “Post Hoc On/Off Medication and Antipsychotic Dose” column). Extensive validation to confirm the findings obtained using 2D-DIGE was undertaken. See Figure 3 for the details of this validation work. Using Western blotting on subpooled samples and individual samples from CA2/3, no significant differences between groups were observed. Results from 2D-DIGE showed a reduced expression in CA2/3 in bipolar disorder (−1.65-fold; P = .01) and in schizophrenia (−1.59-fold; P = .009). Dot blots from samples of CA2/3 showed trend reductions in protein levels for both diseases (ANCOVA, P = .07). Post hoc t tests confirmed reductions in schizophrenia (−6.3%; P = .03) but not in bipolar disorder (−5.4%; P = .11). Results from 2D-DIGE showed a reduced expression in CA4 for 2 spots in bipolar disorder (−1.11-fold [P = .04] and −1.13-fold [P = .03]) and in CA2/3 for 2 spots in bipolar disorder (−1.15-fold [P = .002] and −1.13-fold [P = .001]) and 1 spot in schizophrenia (−1.12-fold; P = .004). Using enzyme-linked immunosorbent assay, reduced expression in disease groups in CA4 was confirmed (ANCOVA, P < .001). Post hoc t tests confirmed reductions in schizophrenia (−19.2%; P < .001) and bipolar disorder (−16.3%; P < .001). Results from 2D-DIGE showed a reduced expression in CA4 in schizophrenia (−1.34-fold; P = .005) and bipolar disorder (−1.23-fold; P = .02), in the DG in schizophrenia (−1.29-fold; P = .01), and in CA2/3 in bipolar disorder (−1.16-fold; P = .03). Using Western blotting on subpooled samples of CA2/3, reduced expression in disease groups was confirmed (ANCOVA, P < .001). Post hoc t tests confirmed reductions in bipolar disorder (−17.3%; P < .001) and schizophrenia (−10.8%; P = .004). Results from 2D-DIGE showed a reduced expression in CA2/3 only in bipolar disorder in 2 spots (−1.21-fold [P = .03] and –1.36-fold [P = .04]). Using Western blotting on subpooled samples of CA2/3, reduced expression in disease groups was confirmed (ANCOVA, P = .006). Post hoc t tests confirmed reductions in bipolar disorder (−6.3%; P = .02) and schizophrenia (−7.8%; P = .002). Results from 2D-DIGE showed a reduced expression in CA2/3 only in bipolar disorder (−1.45-fold; P = .02). Using Western blotting on subpooled samples of CA4, reduced expression in disease groups was confirmed (ANCOVA, P < .001). Post hoc t tests confirmed reductions in schizophrenia (−11.2%; P < .001) and bipolar disorder (−6.0%; P = .002). Results from 2D-DIGE showed a reduction in 2 spots in CA4 in schizophrenia (−1.14-fold [P = .04] and −1.20-fold [P = .01]) and in bipolar disorder (−1.12-fold; P = .04) as well as a reduction in CA2/3 in bipolar disorder (−1.17-fold; P = .01). Western blot analysis demonstrated that ANXA6, FSCN1, PCMT1, SEPT11, and SPTAN1 were not significantly altered in mice treated with haloperidol (eFigure). This confirmed that our findings are disease related rather than drug related. Previous studies have suggested that the CA2/3 region of the hippocampus may be particularly vulnerable to neuropathological changes in psychosis.18,63-68 This is particularly evident in relation to the pathology of GABAergic interneurons in schizophrenia15,18,69-72 but is less clear in relation to markers of synaptic and glutamatergic function72,73 and in relation to mood disorders.7,65,72,74,75 Using an unbiased proteomic approach to assess protein changes within different hippocampal fields, we have shown an excess of differential protein expression in disease within CA2/3 compared with the other regions. It has been suggested that this region shows a particular vulnerability in schizophrenia17 possibly owing to altered basolateral amygdala projections to CA2/3.17,76-79 The CA2/3 region has close functional connections to many other brain regions including the hypothalamus, septal nucleus,80 subiculum,81 and the CA1 region of the hippocampus.82 Thus, while we confirm and extend the knowledge implicating the hippocampus and the CA2/3 region in schizophrenia20,83 and bipolar disorder, changes in this region will have widespread consequences within the brain. In keeping with previous proteomic studies of schizophrenia and bipolar disorder,38 including one of the hippocampus in schizophrenia,90 our findings implicate proteins involved in cytoskeletal42,46,90 and metabolic42,45,46,48,58 cellular mechanisms and, specifically in bipolar disorder, cell death pathways.91,92 The results complement findings of transcriptomic investigations in these brain regions.9,93-98 In the cases of ANXA6, Bcl2 inhibitor protein BNIP3, N(G),N(G)-dimethylarginine dimethylaminohydrolase, galectin-1, and heat shock cognate 71-kDa protein, our findings are supported by recent genome-wide association studies.99 Ingenuity Pathways Analysis in our study notably identified cellular assembly and organization as one of the main categories of protein function altered in both schizophrenia and bipolar disorder (Table 2). These findings implicate CME in schizophrenia and bipolar disorder. They are important because NMDA receptor hypofunction is a potential key pathophysiological mechanism in schizophrenia (see the articles by Coyle124 and Labrie and Roder125 for review) and may be caused by altered NMDA recycling.126 Furthermore, antipsychotics and mood stabilizers modulate CME to various degrees. For example, antipsychotics antagonize the interaction of dopamine D2 receptors with the CME-associated protein β-arrestin-2,127 and chlorpromazine inhibits CME.112 Furthermore, lithium inhibits β-arrestin and may influence CME.128 Finally, in keeping with our findings implicating cytoskeletal function in schizophrenia, there is growing evidence for a role of the actin cytoskeleton in CME through the modulation of cell membrane tension and the invagination of clathrin-coated pits.129 Thus, our findings implicating cytoskeletal function and CME may be related. Future work will need to consider the functional aspects of CME within cellular domains such as within the postsynaptic density130 where CME changes would directly affect NMDA recycling. Our study has significant advantages such as its quantitative nature, reliability, and sensitivity.40,131 There are also several potential limitations. Postmortem brain studies are potentially confounded by premortem and postmortem factors; thus, we statistically adjusted for the variation introduced by age, brain pH, postmortem interval, and refrigerator interval. We also carried out post hoc analyses within the disease groups for the effects of antipsychotic medication, mood stabilizers, and antidepressants (eTable 5). Forty-five proteins were implicated by these analyses, but most in the direction opposite to that observed in disease, thus arguing against our findings being due to medication effects. However, for 2 proteins relevant to our discussion, dynactin subunit 2 and FSCN1, alterations were in the same direction as that associated with mood stabilizers and may reflect treatment effects with mood stabilizers (although in the case of FSCN1, reduced expression was observed even after excluding subjects exposed to mood stabilizers [data not shown]). There was no evidence that the changes observed in any of the other validated proteins were due to psychotropic drug exposures. Furthermore, long-term exposure of mice to the antipsychotic drug haloperidol did not alter the expression of the proteins confirmed to be dysregulated in disease, suggesting that the changes observed in disease were not related to treatment with this antipsychotic agent. Nonetheless, while we can correct statistically for these potential confounders, such corrections are imperfect and it is possible that some of our findings are due in part to such confounders as drug exposure or environmental deprivation. Our findings should therefore be interpreted with some caution pending further information regarding the influence of these and other potential confounders. Finally, the 2D-DIGE method has some disadvantages such as the inability to resolve all proteins within a given proteome. Specific classes of proteins, particularly those with low abundance, exceptionally small or large proteins, and proteins that are highly hydrophobic or basic, remain difficult to visualize.39 For this reason, candidate transmembrane receptor proteins such as NMDA and GABA receptor proteins73 were not resolved in our gels and were not assessed. Our data should be viewed as complementary to rather than opposing this previous literature. A challenge of proteomic analysis involves the necessity of assessing multiple spots and the possibility of type I error. At the 5% level of significance, there was an excess of statistically significant spots (up to 8% depending on brain region). While an excess of statistically significant spots was found, these corresponded to, at most, moderate changes in protein abundance and the realized P values were not on a small enough scale to offset any adjustment of false discovery rate when brain regions were analyzed separately. However, many spots remained significant using the 5% level of false discovery rate when all 4 brain regions were analyzed together in a single model (as a factor) while allowing different brain regions to differ in effect (eTable 4 and eTable 5). This was a consequence of the greater precision arising from a greater number of replicates effectively analyzed. To further compensate for potential false-positive results, we also selected a number of proteins for validation. Our innovative use of pooled samples for the validation work is unusual and was necessitated by the unique and small amounts of available tissue dissected by laser-assisted microdissection. We confirmed altered expression of ANXA6, PCMT1, SEPT11, and SPTAN1 in schizophrenia and/or bipolar disorder, but we could not confirm the altered expression of ARMCX1. Changes in FSCN1 were confirmed only in schizophrenia and not in bipolar disorder. Further, while it was not technically feasible for us to validate all of our findings, many of our findings are consistent with previous studies where altered expressions of dynamin-1,44,45,51 neurofilament light polypeptide and neurofilament medium polypeptide,46,90 N(G),N(G)-dimethylarginine dimethylaminohydrolase 1,42,90 ubiquitin carboxyl-terminal hydrolase isozyme L1 and cathepsin D,90 α-internexin,44 dihydropyrimidinase-related protein 2,42 14-3-3 protein,46,90 stathmin,46,90 fructose bisphosphate aldolase C,46,50 peroxiredoxins42,45,90 and superoxide dismutase,51,90 α-enolase, and galectin-142,46 have been reported. Our observation that a significant minority of proteins were differentially expressed in more than 1 hippocampal region in each disease offers reassurance that these latter changes are unlikely to represent chance findings. Thus, for 15 of 67 proteins shown to be differentially expressed in schizophrenia (eg, SEPT11, PCMT1, cathepsin D, adenosine triphosphate synthase, N(G),N(G)-dimethylarginine dimethylaminohydrolase 1) and 25 of 115 proteins for bipolar disorder (eg, PCMT1, adenosine triphosphate synthase, N(G),N(G)-dimethylarginine dimethylaminohydrolase 1, FSCN1, dynactin subunit 2), we also found similar significant changes in protein expression in 1 or more of the other hippocampal regions (eTable 4 and eTable 5). In the future, high-throughput validation methods such as multiple reaction monitoring,132 a label-free relative quantitative proteomic analysis, may allow us to confirm a greater number of proteins regardless of antibody availability. In conclusion, our findings provide novel insights into the common disease pathogenesis of both schizophrenia and bipolar disorder. They also show a particular focus of altered protein expression changes in the CA2/3 region of these disorders. Correspondence: David R. Cotter, MD, PhD, Department of Psychiatry, Royal College of Surgeons in Ireland, Education and Research Centre, Beaumont Hospital, Dublin 9, Ireland (drcotter@rcsi.ie). Submitted for Publication: August 6, 2010; final revision received November 1, 2010; accepted December 16, 2010. Funding/Support: This work was supported by the Wellcome Trust, NARSAD, and the Stanley Medical Research Institute. Additional Contributions: Postmortem brains were donated by the Stanley Foundation Brain Bank Consortium courtesy of Llewellyn B. Bigelow, MD, Maree J. Webster, PhD, and staff. Koh-ichi Nagata, MD, PhD, donated the SEPT11 antibody. We thank the donors. Lance Hudson, BSc, Niamh Connolly, MSc, and Conn Hastings, BSc, shared their expertise in laser-assisted microdissection and animal work, Caitriona Scaife, BSc, provided technical assistance in 2D-DIGE image analysis, Peter Knief, PhD, helped with the figures, and Mary Cannon, MD, PhD, provided input into the final manuscript. Access to and use of mass spectrometry instrumentation of the Conway Institute is gratefully acknowledged; Giuliano Elia, PhD, Cathy Rooney, BSc, and Kasper Pedersen, BSc provided technical assistance in mass spectrometry.